One of the joys of driving by car through Poland in the 1970s was that one could never go very far without coming across something of interest to a railway enthusiast. On the western side of the country that something was, as likely as not, a vintage steam engine pulling a train of goods wagons along some rickety narrow gauge tracks. Alas those days are gone for ever, like the horse drawn carts that used to out number cars in country areas. If only, as one of our regular correspondents is wont to say, one had a vehicle that could go back in time. For those of us not fortunate enough to posses such a machine, the WIG website is the next best thing. I hasten to add that I do not mean the Warszawski Indeks Giełdowy, useful as the Warsaw’s Stock Exchange index might be, but rather the maps published before WW II by the Wojskowy Instytut Geograficzny. The WIG 1:100,000 maps are the equivalent of Britain’s old 1 inch to the mile Ordanance Survey mapping. The 1950s are frequently considered as the zenith of the Polish narrow gauge. PKP built new lines, relaid industrial lines and largely standardised on the 750 mm gauge. However, though the 50s are the time when Poland had the greatest mileage of public narrow gauge railways, the real n.g. heydey was in the inter-war years, when the newly formed PKP’s narrow gauge lines co-existed with am enormous mileage of other narrow gauge railways. These included private estate railways, forestry railways, sugar beet railways, colliery and quarry railways and hundreds of industrial lines both large and small. Thanks to the on-line archive of historic WIG maps maintained by the Archiwum Map Wojskowego Instytutu Geograficznego 1919 – 1939, a trip back to the Poland of the inter war years needs just lots of time and a little imagination. Just how large Poland’s network of secondary narrow gauge lines once was, can be contemplated by going on a virtual journey from Kalisz to Zbiersk via the Kaliska Kolej Dojazdowa. (WARNING – the maps are very large files – do NOT click on the links unless you have plenty of hard disk space and a fast Internet connection.) We start at the standard gauge station (P42_S26_OPATOWEK, 1934) The narrow gauge station is on the other side of town, some way from the elegant mainline station, so we better hire a horse drawn dorożka. Some 25 minutes later we arrive at the narrow gauge station (P41 S26_KALISZ, 1935-6). Here a diminutive Kraus 0-6-0T with a distinctively home-made tender waits to haul our two coach passenger train. The guard shouts ‘Odjazd!’ and with an answering toot from the engine we depart from the station. We chug along the main road and reach our top speed of 30km per hour. but soon it is time to slow down. With a shrieking whistle we cross the main road and pull into our first halt, some 12 minutes after leaving the line’s Kalisz terminus. 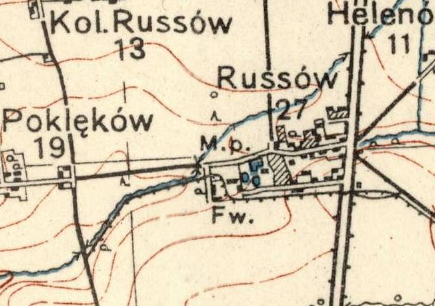 Though in PKP days the branch to Russow ended in a sugar beet loading area adjacent to the main road, the line was once a model estate railway in its own right. Soon we are off again, and now that we are away from the main road our top speed seems to be a little higher, but soon we are slowing down again. On our left a private estate railway joins us. It leads to the farmyard at Russow and the watermill beyond. (Though it is now badly overgrown, the track still goes as far as the main road and was used by a special train collecting a party of Brits from the hotel in Russow as recently as recently as 2007.) Soon with another scream from the engine’s whistle, we cross another main road and the branch from the standard gauge goods transshipment point at Opatowek joins us from our right. We trundle slowly into the station at Zelazkow, a short ‘L’ shaped sugar beet branch joins us from our left before we reach the low platform. Hardly have we stopped when we are off again, though some 7 minutes later we are pulling into a rather larger station with a long passing loop at Goliszew. Here we take a little more time time unloading people and their baggage. Now we have a clear run for nearly 4 kilometres, but we do not really pick up speed till we cross a short sugar beet siding and run through the request halt at Zlotniki Wielkie. Just before we reach Zbiersk another railway joins us, but maintains its own right of way on our left. This wanders all over the countryside and pointedly by-passes all the major villages, but runs close to, or throws off branches, to join the major farms. From its rambling route, which ignores such minor details as contour lines, it is possible to deuce that its construction was the result of an agreement between several major landowners and the sugar refinery that had contracted to buy their sugar beet. Amazingly, after about 20 kilometres this railway reaches its own standard gauge transshipment point at Kucharki. Just before we reach Zbiersk this lines veers off to our left and shortly afterwards splits three ways. The right fork rejoins the KKD ‘mainline’, the middle track runs straight into the sugar refinery, the left fork continues northwards, runs through a wood and serves a brickyard. If we are lucky we might see an elderly O&K 0-4-0 shunting wagons in the refinery yard. It is interesting to note that the Zbiersk sugar refinery could gather most of its sugar beet without its wagons running over KKD metals and that the factory could also ship its refined sugar to its own standard gauge interchange without touching KKD tracks. No doubt these two facts gave the sugar refinery owners a good bargaining position when negotiating tariffs with the local authority owners of the KKD. Our trip to Zbiersk – some 25 kilometres in all – would have lasted about 1 hour 20 minutes. Downloading the maps and researching the salient features to be seen during the journey took about half a day. 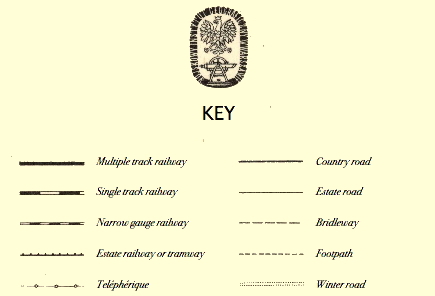 Any readers out there fancy preparing a virtual exploration of the Kujawy Railways, about 1,000 kilometres in all? Sectioned S6 on the Skierniewice turntable. If you travel through Skierniewice by train, cast a glance at the old roundhouse which houses the amazing collection of rolling stock gathered together by the Polskie Stowarzyszenie Miłośników Kolei (Polish Railway Enthusiasts Association). Though most of the collection is inside the roundhouse, a few steam engines can be seen outside, including the last surviving Prussian S6 4-4-0. The story of the S6’s survival is worth telling, particularly as this particular engine never, as far as it is known, worked in Poland! The S6 class locomotive was development of the Prussian Class S 4 4-4-0s intended for fast express trains. It was designed in 1904 by Linke-Hofmann of Breslau. The design was championed by Robert Garbe, the Prussian Railways Head of Locomotive Design and Procurement. Between 1906 and 1913 ,a total of 584 S6s were manufactured by Linke-Hofmann, Henschel-Werke and Maschinenbauanstalt Humboldt. They were the last four-coupled, express locomotives to be built in Germany. It is interesting to compare the design features of the S6s with those of their British contemporaries, the North British Railway’s J Class (LNER D29) ‘Scott’ 4-4-0s. It was not until 1927 that the LNER (of which the NBR had become a part) would build a modern 4-4-0 with outside cylinders and valve gear – Nigel Gresley’s D49 ‘Hunt ‘ / ‘Shire’ class. The PKP classification for the S6s was Pd5. 81 Pd5s ran on Polish State Railways before the outbreak of WWII and 37 continued to work after the war, the last one being withdrawn in 1958. None of the engines that ran on PKP metals were preserved. The S6 at Skierniewice owes its continued existence to a strange quirk of fate. Formerly DRB 13 1247, it was built by the Linke-Hofmann-Werke in Breslau (Wroclaw) and in withdrawn from active service in December 1928. The locomotive was used as an instructional exhibit to train future generations of enginemen. At some stage it was partially sectioned and by 1945 it had found it way to Lodz. In 1954 it was set up outside the Railway Technical College in Warsaw carrying the fictional designation Pd5-17. On 23 April it was delivered to the PSMK’s base in Skierniewice on three low loaders. 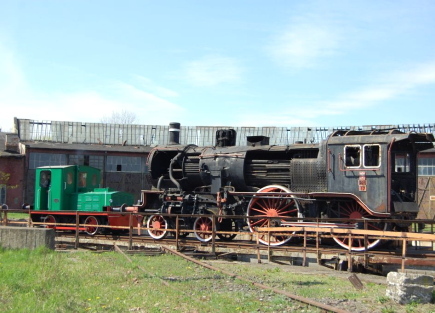 Is it too much to hope that as a result of some future Polish – German project this historic locomotive could one day be restored to run again? Robert Hall in Smigiel, 22 July 2010. BTWT guest author Robert Hall, is visiting Poland, visiting narrow gauge railways and filling in the gaps in his travels over the Polish railway network. On Thursday 22 July, he was in Smigiel where he met Wiktor Snela, the Mayor. Robert expressed his concern that the Mayor had blocked recent initiatives such as the proposed restoration of the Smigiel Railway’s own steam locomotive, Px48-1765. The mayor replied that the Council could not afford to make any investments in the railway, and were in any case thinking of not renewing the operating agreement with SKPL on its expiry in 2012, but setting up their own company to run the railway. 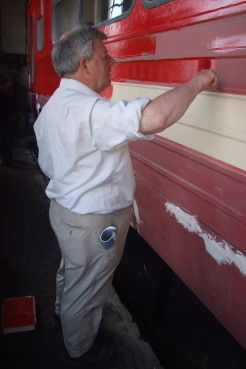 After talking to the Mayor, Robert was joined by Howard Jones and Wolsztyn Experience guests, Julian Maddock and Jeff Nichols, and took part in a working party to paint a Romanian DMU trailer car. We look forward to publishing Robert’s own account of his recent railway travels across Poland in due course. Gniezno Railway Px48-1919 being unloaded at Smigiel Station in February 2008. Photo Marek Ciesielski. The post-PKP history of the Smigiel Railway is of one disappointment after another. Last year, the Smigiel Town Council were approached by a British railway enthusiast who wanted to restore the dead Px48-1765 in Smigiel Station. In return for his efforts, the prospective benefactor wanted to acquire the legal title to the engine. He was quite happy to sign a covenant requiring the locomotive to spend the majority of its time working on the Smigiel Railway – the Council turned him down flat. Then there was the demand for local tax payments of about 100,000 PLN (﻿£20,000) – curiously the railway receives a 100,000 PLN subsidy from the provincial government. SKPL managed to win that battle by appealing over the heads of the Council Chief Executive to the Council members as a whole. Next came the episode with the coal trains. A local coal merchant was keen to increase the amount of coal he was bringing into Smigiel. There was talk of 25 standard gauge wagons coming into Stary Bojanowo at a time which would have involved 13 shuttle trips along the line to deliver the coal to Smigiel. Weak portions of railway line, including parts of the standard gauge interchange yard in Stary Bojanowo were treated to spot re-sleepering in order to bring the line up to scratch. Enter Cargo Sped, a curious joint venture between certain PKP Directors and PKP Cargo itself. Cargo Sped offered the coal merchant a reduction in tariff of 10 PLN/tonne, if he would only accept delivery in the standard gauge coal yard at Wloszakowice rather than Smigiel. For the time being the agressive Cargo Sped price has meant the demise of freight traffic to Smigiel. Enter a Smigiel businessman. He was also interested in restoring the engine for use on the Smigiel railway and occasional use elsewhere. He was quite prepared for the legal ownership of the Px48 to remain with Smigiel Council, but wanted a 25 year long licence to use the locomotive – he was also turned down. Now comes the latest pinprick – there was until recently a small restaurant in the former waiting room at Smigiel Station. The rental payments from the restaurant owner provided the Smigiel Railway with a modest income of some 500 PLN (﻿£100). Now the Council have arbitrarily removed the waiting room room area from the land licensed to SKPL in order to lease it to the police! One veteran Smigiel driver compares the present situation at Smigiel to the one that pertained at Kosniewice when the mayor wanted to drastically reduce the land and buildings used by SKPL – when SKPL protested the mayor closed the railway. The current licence agreement between SKPL and Smigiel Town Council has two more years to run. If things go on as at present it seems unlikely that the council will agree to a new agreement on terms that SKPL can possibly accept. Given that Smigiel Town Council have invested absolutely nothing in the railway since they acquired it, am I being too cynical in thinking that some Council officials may have alternative plans for the railway land? A friend has e-mailed a scanned copy of a PKP InterCity staff leaflet. He is clearly incensed. He heads his e-mail – Western standards, or lack of thinking, oppression and fear? He continues in much the same vein. I have never seen anything so absurd. Is anyone in charge of what on-board ticket inspectors are being forced to do? …particularly worthy of note is Rule 13 and its subsidiary point that the customer is always right. Does this mean that customers can insult us and afterwards we will then have to thank them? It is difficult to understand how this little leaflet can arouse such ire; nothing in it is particularly controversial. It sets out 16 basic principles such as, Remember that in every situation you are representing PKP InterCity and Keep your knowledge of railway regulations and current special offers and promotions up to date. The supposedly controversial rule 13 says, If a client is aggressive, try to help ease his temper, while the sub-clause, which so excited my correspondent, merely says, Never tell the client that he is mistaken, which is not the same thing at all as instructing staff that the customer is always right. Yet there is something fundamentally wrong about the way that PKP and its subsidiaries treats its customers. Take my experience at Poznan earlier today. I had 5 minutes to catch my connection to Stary Bojanowo. My train from Warsaw had arrived 10 minutes late. As I jumped onto the platform, I heard the announcer tell passengers to hurry up for the connecting train to… a list of stations… Stary Bojanowo was not among them. I rushed down to the subway looking for a timetable. I spied 5 timetables… all gave the time of arrivals, not departures. At last a yellow departures timetable, but the new slim line format does not allow all intermediary stations to be listed. According to it there are no trains to Stary Bojanowo from Poznan ever. I barge rudely to the front of the queue to the information window only to be told that I have just missed my train. In despair I make my way to the train dispatcher’s office. Here I receive a lecture. We held your train for 8 minutes. Yet you and a whole crowd of others failed to make your connection. Didn’t you hear the announcements? Yes, I heard the announcements, but no Stary Bojanowo was mentioned. Yes that’s right we don’t announce all the intermediate stations; we expect you to know the ultimate destination of your train. 10,000 million zloty down the drain? 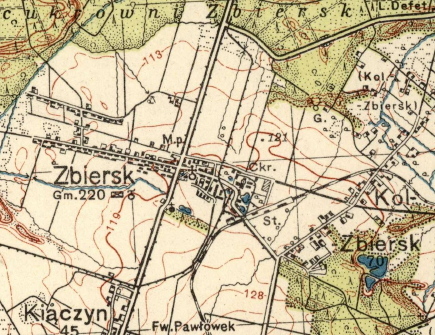 Lodz Fabryczna as enlarged by PKP after WW I. The Koluszki – Lodz railway line – a branch of the Warsaw – Vienna Railway – was opened on 18 November 1865 for the carriage of goods. Passenger services were inaugurated on 1 June 1866. Initially, the railway reached further west than at present; a temporary station was built at the location now occupied by the Lodzki Dom Kultury (Lodz Arts Centre). In 1868, the current Lodz Fabryczna station was built at the initiative of Lodz industrialist and philanthropist, Karol Scheibler. It was designed by Adolf Schimmelpfennig. The station was built in a Baroque-baronial style and when after WWI the newly formed PKP came to enlarge the station, the new extensions were carefully designed to complement the existing building. The extended station survived WW II and also was left unscathed by post-was PKP’s mania for demolishing all buildings of any architectural merit and replacing them with modernist non-entities. So what are PKP and the City of Lodz planning for the future of Karol Scheibler’s station? Scheibler did after all establish Lodz as a major centre of Europe’s textile industry and his factories and railway lines established the shape of the modern city. Maybe they will give the historic building a light skin of glass like the Gare de Strasbourg in France? Not a bit of it! The plan is to demolish Scheibler’s building and replace it with an underground station at a cost of some 10,000 million PLN. Juliusz Engelhardt, the Undersecretary of State at the Ministry of Infrastructure responsible for rail, has recently said that only 22 of Poland’s 1,000 top stations come up to contemporary requirements. Rafal Szafranski, the chairman of PKP PLK (the Polish State Railways infrastructure company) has said that some 10,000 route kilometres of Poland’s railways face the axe. In such circumstances sending 10,000 million putting Lodz Fabryczna underground is an act of wanton folly. And the reason for this madness? To turn make Lodz a ‘City of Culture’. Poor Karol Scheibler must be turning in his mausoleum. Lodz Fabryczna station as ‘improved’ in the 1960s. Work has begun on dismantling some prefabricated buildings at the old Lodz Fabryczna railway terminus – the start of a 10 billion PLN project for PKP to relinquish the 1865 station building and build a brand new railway station… underground! Lodz is – in terms of population – Poland’s third largest city. It was the second… but many of its young generation are now working on building sites in the UK. So it is interesting to look at PKP’s plans for its new station and compare them with the latest practice in the construction and renewal of major railway station around the world. Bejing South opened in August 2008. It was designed by Terry Farrell & Partners with Arup as structural and services engineer and Atkins as railway engineer. The station has 24 platforms and a capacity of 30,000 passengers per hour – 242 million passengers per year. It will serve high speed trains which will travel at up to 350 km/h. The passenger concourse is on the ground floor and escalators take passengers up to the platforms at first floor level. Access for vehicles and car parking is on the next level above. The new station replaces an earlier construction dating back to Victorian times. Bejing South is undoubtedly the most exciting new railway station design in the world. Gare du Nord in Paris. Photo by Ignis. Gare du Nord is the most important railway station in Paris. It serves 180 million passengers a year and is the busiest station in Europe and the third busiest in the whole world. The first station on this site was built in 1846. By 1854 the station was already to small and it was demolished in 1860 . The stone facade was preserved and rebuilt at Lille. The present station was designed by Jacques Hittorff. The choice of architect was made by the chairman of Chemin de Fer du Nord, Baron James de Rothschild. The support pillars inside the station were cast at Alston & Gourley’s ironworks in Glasgow. Since it opened in 1864, the buildings and railway tracks have been extended several times. In 1975 Gare du Nord was registered as a historic monument. Today it is a major transport hub which is served by Eurostar, Thalys and TGV high speed trains; local services are provided by RER lines D and B and Metro lines 2, 4 and 5 There is also a Velib bicycle sharing facility. Recycled Atocha Railway Station, Madrid. Photo Logan 5. Madrid’s Atocha Station is a major hub on Spain’s railway network. It is served by AVE high speed trains, ordinary main line trains and the Madrid metro. Excluding metro journeys, the complex serves some 80 million passengers a year. The first railway station on the site was opened in 1851. After a fire, it was rebuilt and reopened in 1892. The architect for the replacement was Alberto de Palacio Elissagne, who collaborated with Gustave Eiffel and Henry St James on the engineering aspects of the design. The arch of the glass roof is slightly pointed, perhaps inspired by the arch of London’s St Pancras station opened 24 years earlier in 1868. This complex of railway tracks expanded through the years. 1985 marked the start of a major rebuilding project. In 1992, the original building was taken out of service as a train shed, and converted into a concourse with shops, cafés, a nightclub and a 4,000 m² covered tropical garden. A much larger train shed designed in the modern minimalist style by Rafael Moneo has been constructed behind the old building in the area that was formerly the station throat. There are separate mainline and commuter stations as well as a 4 track underground station for trains travelling across the city. Part of the platform level at Berlin Hauptbahnhof. From a photograph by Daniel Schwen. Berlin Hauptbahnhof is the most important station in Berlin and has become the city’s most important transport node. It provides facilities for East – West mainline services (served by platforms raised above the concourse) and the new North South rail-link (served by platforms in the basement). It also provides facilities to a number of Stadtbahn services and is linked to a new branch of the Berlin metro. It is used by some 110 million passengers each year. The first station to be built on the site was Lehrter Bahnhof, the Berlin terminus of the Magdeburg Halberstädter – the Hannover – Lehrte – Berlin railway. It was was designed in the French Neo-Renaissance style by Alfred Lent, Bertold Scholz, and Gottlieb Henri Lapierre. It was opened in 1871. During WW II the station was severely damaged. After the war, the building was patched up. However, the postwar division of Berlin spelled the end for the station’s mainline status. On 28 August 1951, the final train departed from Lehrter Bahnhof. On 22 April 1958 the main entrance was dynamited. Only the Lehrter Stadtbahn station remained, serving suburban services crossing over the north end of Lehrter Bahnhof on a bridge. Demolition work was completed in the summer of 1959. The Stadtbahnh station survived the war intact, and in 1987 was restored at a cost of about DM 10 million and was listed as a historic building, However, despite its listed status, in 2002, Lehrter Stadtbahnhof was to meet with the same fate as Lehrter Bahnhof – it was demolished. Now a new grand central station has been built on the site of the both stations. The design of the new station – a powerful symbol of a reunited Germany – is by Hamburg architect, Meinhard von Gerkan. Zurich Hauptbahnhof from the east. Photo by Ikiwaner. Zurich Hauptbahnhof is the busiest railway station in Switzerland and is served by trains travelling to Spain, France, Italy, Austria, Germany and beyond. It is the most important hub in the city’s integrated transport system. There are 20 terminal tracks on the concourse level of which 16 are used by main line services and 4 for local suburban S-Bahn services. There is also a lower level containing 200 shops and further platforms. On its southern side are two tracks used by the Sihltal Zürich Uetliberg Bahn commuter railway, and on the northern side there are 4 tracks used by local suburban and S-Bahn services. Another 4 tracks are under construction between the two for the new cross-city ‘diameter. The station directly links to 4 tram and bus stations. On sundays, when most shops in Zurich are shut, it becomes the busiest place in the city. It is used by some 110 million passengers each year. The first station on the site was built by Gustav Albert Wegmann for the Swiss Northern Railway and opened in 1847. By 1871 it was already to small and it was demolished. It was replaced by a stone and steel train shed spanning 6 tracks fronted by a magnificent neoclassical headquarters designed by Jakob Friedrich Wanner. By 1902, the station was again too small, the train tracks were pushed back. The last two segments of the train shed were cut back – the remainder became a baggage handling area. Freed from the constraints of the old train shed four more tracks were added; another 6 were to follow in due course. With no more space to grow at ground level, further expansion of the station is planned to take place underground. St Pancras – the subject of the most dramatic and expensive railway station modernisation project in Great Britain – almost failed to make it to the 21st century. In the 1960s, a run down British Railways – desperately short of cash – planned to run services terminating at St Pancras and Kings Cross stations into a single new station, demolish the old buildings and use the land so released for property development. Today, thanks to a £800 million refurbishment, St Pancras International, as the revamped station has been dubbed, is the most prestigious station in London. Eurostar trains run from St Pancras, over HS1 – Britain’s only high speed line, to Paris and Brussels. Deutsche Bahn wants to run ICE trains To St Pancras from Cologne and other locations in Germany. St Pancras International Station is now one of London’s major landmarks, and an important gateway to the Continent. International services run from a new security compound within the historic train shed. Domestic services run from an extension built in the former station throat area. The new station includes 60 shops occupying 82,000 sq ft (7,600 sq m) of retail space and is used by 45 million passengers annually. King’s Cross St. Pancras is also the busiest station on the London Underground, serving over 70 million passengers a year..
Site clearance for the construction of St Pancras Station and the accompanying Somers Town Goods Depot started in 1864. Construction of the station foundations did not start until July 1866. A competition was held for the design of the station hotel and railway offices in May 1865. In January 1866, Sir George Scott’s Gothic revival design – costing £315,000 (£21.4 million at 2010 adjusted for inflation) – was chosen. The Midland Railway board was by no means unanimous, Scott’s design was by far the most expensive. In the end a British compromise was negotiated – Scott’s design was adopted, but two floor levels were lopped off the office block and one floor off the hotel! The rest of the station was designed by William Henry Barlow, chief engineer of the Midland Railway Company, with help from Roland Ordish. Their slightly pointed train shed complements the Gothic arches of Scott’s hotel building. It has a span of 232 ft (74 m), rises 100 ft (30 m) high and is 700 ft (213 m) long. At the time, their train shed was heralded as an engineering marvel – enclosing the largest unsupported indoor space in the world. The station opened on October 1st, 1868. The eastern wing of Scott’s hotel building opened in May 1873, the rest followed in Spring 1876. The passing years were not kind to St Pancras. In 1923, the Midland Railway became part of the London, Midland and Scottish Railway. The LMS decided to focus on Euston as it major London terminus. The magnificent hotel was closed in 1935; its closure hastened by the Great Depression. The once great rooms were partitioned turned into offices. The station experienced a brief revival in the 1960s when electrification work on the West Coast Main Line saw trains to Manchester and Glasgow running from St Pancras. These services were switched back to Euston in 1966 when the works were complete and British Railways announced its intention to demolish the station. But it was not to be. A group of preservationists, who had fought long and hard the lost the battle to save Euston’s Doric Arch, were determined not to be defeated again. Their campaign under the flag of the Victorian Society persuaded Lord Kennet, Parliamentary Secretary at the Ministry of Housing and Local Government, to grant the station and its former hotel building Grade 1 listed status. In the 1980s the hotel building failed a fire inspection, British Railways closed the offices contained therein and the building lay empty save for occasional film makers who relished the gloomy and neglected atmosphere. In 1990s the tide turned – a £10 million project financed jointly by British Rail and English Heritage made the building weatherproof and commenced the restoration of the station exterior. The work was interrupted by the privatisation of British Rail, but soon plans were put forward to make St Pancras the London terminus of the much-delayed Channel Tunnel link (later dubbed HS1). In 2001, work commenced on the complete transformation of the station according to designs by Norman Foster, later modified by Alistair Lansley. The rebuilt station was opened by the Queen in November 2007. It has 15 platforms. Domestic services use 4 tracks that finish at the southern edge of the western side of the Norman Foster extension and 3 tracks that finish at the same point on its eastern side. The 6 tracks in the middle extend back into the Barlow – Ordish train shed and are used exclusively by international services. Two tracks on a lower level are used by Thameslink services. The former Midland Hotel is undergoing a thorough rebuilding. It is expected to open in late 2011 as a 244 bedroom 5 star hotel with 67 private apartments. A station should be a major destination landmark in its own right, not just a soulless utility. Important historical elements should be preserved, unless there are overwhelming reasons to the contrary as in Beijing and Berlin. The principle passenger circulating area and platforms should be above ground. There should be good integration with other transport nodes. There should be adequate capacity for the envisaged loadings and future growth. The project should be cost effective. So how do PKP’s plans for the new ‘Lodz Centralna’ station match up against these criteria? Do not miss our next post. 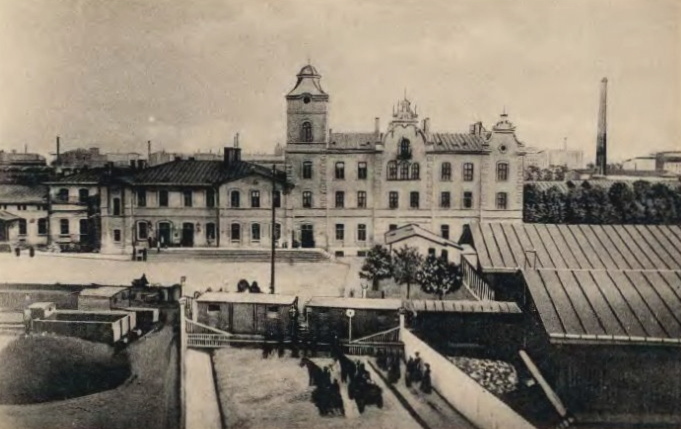 The original Lodz Fabryczna station, built in 1865. How Poland voted map on left, PKP 1952 network on right. I’m suffering from depression. The Poles have voted in a new president – Bronislaw Komorowski – who comes from a party that have an allergy to railways. The Germans beat Britain in round 16 of the World Cup. Now the Tories are considering selling Network Rail to DB. It’s enough to make a chap want to emigrate. Hold on, I have emigrated. Perhaps I should go further East? The Russians and the Chinese are investing heavily in their railways. 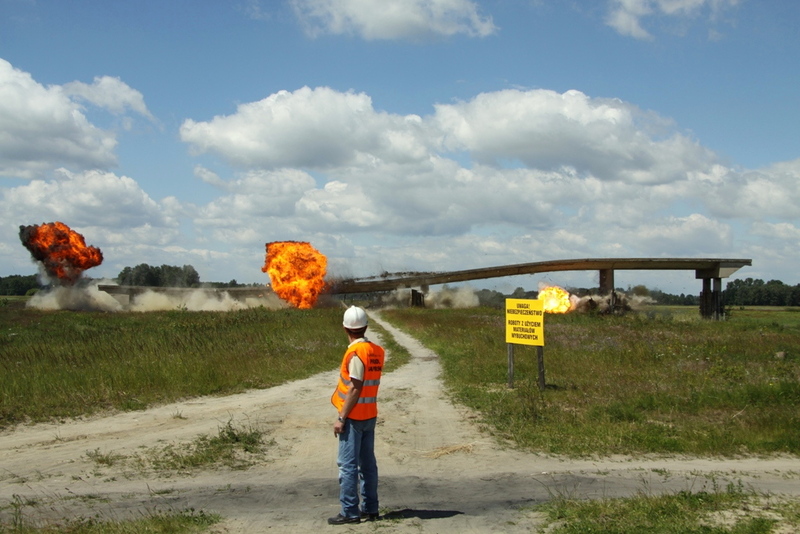 On 23 June, Army engineers blew up the last obstacle on the route of the Strykow – Warsaw section of the new A2 – a viaduct built in the 1970s for the uncompleted ‘Olimpijka’ motorway at Nowa Wies near Zyrardow. Photo GDDKiA. Modernisation of Poland’s railways limps along. Key EU-funded projects are cancelled and Zbigniew Szafranski, the chairman of PKP’s infrastructure subsidiary, Polskie Linie Kolejowe, warns that at the end of the EU structural funding period 2007 – 2013, Poland’s railways will actually be in a worse state than they were at its start. Unless new funds are found, some 7,000 – 8,000 km of railways are expected to close. Meanwhile Poland’s Ministry of Infrastructure has made road building its No.1 priority. Approvals processes have been simplified and new procedures introduced to ensure that the paperwork necessary to pull down EU funds can be generated on time. In May, the Directorate received refunds of 223 million PLN from the EU for expenditure it had incurred under the aegis of The Infrastructure and Environment Operational Program. During this period the Polish Statre Railways infrastructure company PKP PLK failed to recover any funding of its EU funded projects. Moreover in June the Ministry of Infrastructure cancelled two EU-funded modernisation projects: Szczecin – Poznan – Wroclaw, and Warsaw – Bialystok – Lithuania worth a total of 10,000 million PLN. Wielichowo station on the Smigiel Railway in 1991. From a photo by UVW. UVW has published two glorious colour photographs on the www.drehscheibe-foren.de historical forum. They were taken in Poland in the Autumn of 1991. The first is of a beautifully clean 4-6-0 Ok22-31 at Wolsztyn depot. The second was taken at Wielichowo on the Smigiel Railway. The period detail here is interesting. The paint on the railcar has lost some of its freshness and is heavily scratched on the left hand corner of the front. The cinder track to the goods yard is well used. There is a white painted rock to discourage lorries from driving over the pointwork and the vegetation has been cleared from the track in the area of the switch blade. Though the services to Rakonowice have long gone, the level crossing barriers across the road are still in place as are the warning signs on the road. Apart from the general air of abandonment, the greatest difference today is the absence of the engine shed which was demolished in 2002.